Welcome to the dietitians’ storefront! All of our products have been developed with the nutrition entrepreneur in mind. They are created and fine-tuned by our staff and partners with decades of experience in the nutrition business world. Check out the free and affordable products. 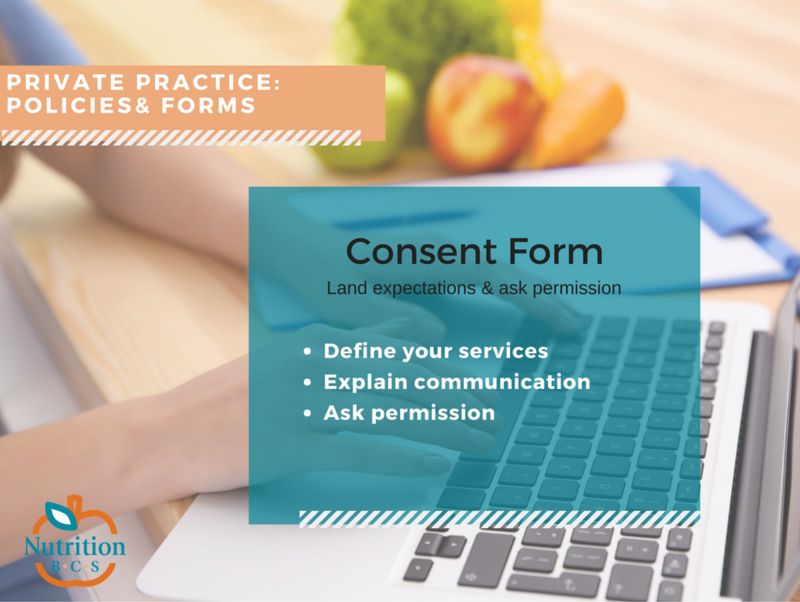 If you are just starting out and have been humming along, take a peek at these great forms for the Private Practice RDN. Get a strong policy or two in place to control no-shows, land expectation, and collect the information that you need. Note: These forms are available for download through our Store Front hosted by a 3rd party. Click “learn more” to read more about each product and see samples. You can then download. 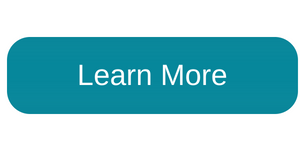 Check out this resource that you can use to capture your patient’s information. You can email it out to your new patient and with the easy fill-in boxes, your patients can have completed prior to their appointment. It also is printer friendly! You can use it as a backup The document is a simple 1-pager that can be customized for your practice. Enjoy! This template is called the Consent Form. It is downloaded as a word document and is 100% editable and customized for your practice. It can be printed or copy and pasted in your EHR or printed out. Ever wonder what I should do with clients that no- show? Or if their payment or insurance does not go through? How to let your client know what they are paying for? What about a refund policy? Every private practice owner should have policies that address just that. Often times these policies are wrapped up into a document that is called a “Financial Agreement”. All of this is available is a professional agreement template that can be customized or copy and paste to an EHR or printed out. Each service has been designed to provide you with cost-effective products to start or grow your business. The service providers have been vetted and come highly recommended by dietitians throughout the country. You can rest assured that all your business needs will be met. Note: Services cannot be purchased from the website. A phone meeting will be set up to make prior to the purchase of services to ensure that your needs can be met. Work with our graphic designer who has designed several of the DPG and RDNs logos. You start with a discovery session and from there you can have up to 3 revision to get the logo that resonates with you. Your final logo is delivered to you with several file types, color and font key. Looking for some insight, a how-to, or should I do? A Download Session is just what you need. Pick your topic(s) and get your pen or pencil ready. Each session is 1-hour. Sessions can be with any of staff (link). One session is $130 or 3 at $325. Let our amazing web designer create your website that is going to work for your business. Jordan has worked with dietitians for the past decade. Training is included in this price. Also, a refresh or technical assistance is available, starting at $75/hour. Explore and design your perfect company by working with our business coach, Nicole. You will set realistic goals, learn what you truly want, and achieve! Nicole has been working with RDNs to create and expand their business. Note: These videos are available for download through our Store Front hosted by a 3rd party. Click “learn more” to read more about each product and see samples. You can then download. Are you someone who is interested in Private Practice? 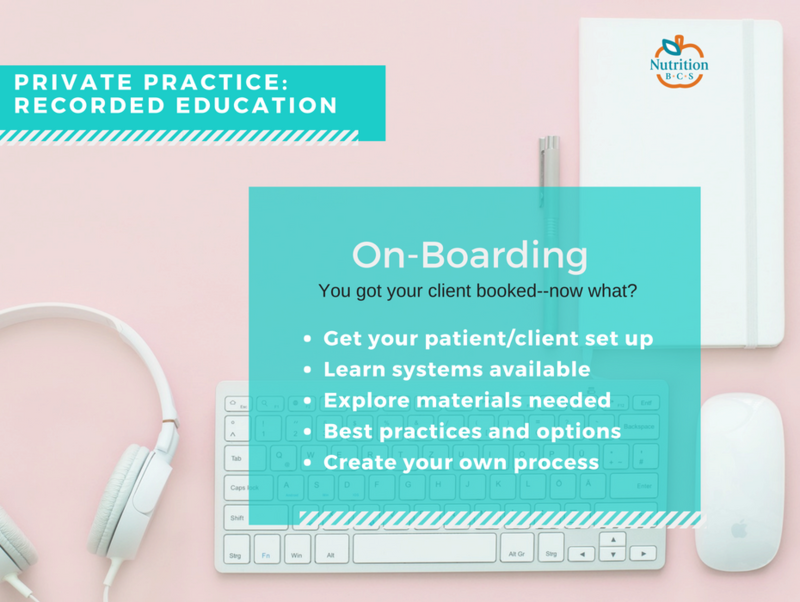 Check out this FREE recorded education session to learn more about private practice. You will start by exploring your whys, then move into a basic business set up, followed by wrapping up with some actionable items and resources. Nicole Goodrich MS, RDN, LDN, the speaker, is the founder of Nutrition Business Consultants and Services a company to help dietitians excel at what they do BEST! The phone rings and you have a client/patient wanting to make an appointment! So exciting!! NOW, what do you do? Having a solid “on-boarding” process is key. Take full advantage of this 30-minute training on what is available from you, what materials you should have in place, and how to create your own process. You will hear several different ideas and pros and cons of different systems.